Since the 1970s, American society has lived with the curse of neoliberalism, or what can be called the latest and most extreme stage of predatory capitalism. As part of a broader comprehensive design, neoliberalism’s overriding goal is to consolidate power in the hands of the financial elite. As a mode of rationality, it functions pedagogically in multiple cultural sites to ensure no alternatives to its mode of governance can be imagined or constructed. Central to its philosophy is the assumption the market drives not just the economy but all of social life. It construes profit-making as the essence of democracy and consuming as the only operable form of agency. It redefines identities, desires and values through a market logic that favors self-interest, a survival-of-the-fittest ethos and unchecked individualism. Under neoliberalism, life-draining and unending competition is a central concept for defining human freedom. As an economic policy, it creates an all-encompassing market guided by the principles of privatization, deregulation, commodification and the free flow of capital. Advancing these agendas, it weakens unions, radically downsizes the welfare state and wages an assault on public goods. As the state is hollowed out, big corporations take on the functions of government, imposing severe austerity measures, redistributing wealth upward to the rich and powerful and reinforcing a notion of society as one of winners and losers. Put simply, neoliberalism gives free rein to finance capital and seeks to liberate the market from any restraints imposed by the state. At present, governments exist preeminently to maximize the profits, resources and the power of the wealthy. As a political policy, it empties governance of any substance and denounces any viable notion of the social contract. Moreover, neoliberalism produces widespread misery and suffering as it weakens any vestige of democracy that interferes with its vision of a self-regulating market. Theoretically, neoliberalism is often associated with the work of Friedrich August von Hayek and the Mont Pelerin Society, Milton Friedman and the Chicago school of economics, and most famously with the politics of Augusto Pinochet in Chile, President Ronald Reagan in the United States and Prime Minister Margaret Thatcher in the United Kingdom. Politically, it is supported by various right-wing think tanks such as the Heritage Foundation and by billionaires such as the Koch brothers. Neoliberalism’s hatred of democracy, the common good and the social contract has unleashed generic elements of a fascist past in which white supremacy, ultra-nationalism, rabid misogyny and immigrant fervor come together in a toxic mix of militarism, state violence and the politics of disposability. Modes of fascist expression adapt variously to different political historical contexts assuring racial apartheid-like forms in the postbellum U.S. and overt encampments and extermination in Nazi Germany. Fascism—with its unquestioning belief in obedience to a powerful strongman, violence as a form of political purification, hatred as an act of patriotism, racial and ethnic cleansing, and the superiority of a select ethnic or national group—has resurfaced in the United States. In this mix of economic barbarism, political nihilism, racial purity, economic orthodoxy and ethical somnambulance, a distinctive economic-political formation has been produced that I term neoliberal fascism. As the ideas, values and institutions crucial to a democracy have withered under a savage neoliberalism that has been 50 years in the making, fascistic notions of racial superiority, social cleansing, apocalyptic populism, hyper-militarism and ultra-nationalism have gained in intensity, moving from the repressed recesses of U.S. history to the centers of state and corporate power.6 Decades of mass inequality, wage slavery, the collapse of the manufacturing sector, tax giveaways to the financial elite and savage austerity policies that drive a frontal attack on the welfare state have further strengthened fascistic discourses. They also have redirected populist anger against vulnerable populations and undocumented immigrants, Muslims, the racially oppressed, women, LBGTQ people, public servants, critical intellectuals and workers. Not only has neoliberalism undermined the basic elements of democracy by escalating the mutually reinforcing dynamics of economic inequality and political inequality—accentuating the downhill spiral of social and economic mobility—it has also created conditions that make fascist ideas and principles more attractive. Furthermore, the merging of neoliberalism and fascism has accelerated as civic culture is eroded, notions of shared citizenship and responsibility disappear, and reason and informed judgment are replaced by the forces of civic illiteracy. State-sanctioned attacks on the truth, facts and scientific reason in Trump’s America are camouflaged as one would expect when led by the first reality TV president—by a corporate-controlled culture of vulgarity that merges celebrity culture with a nonstop spectacle of violence. Neoliberalism strips democracy of any substance by promoting an irrational belief in the ability of the market to solve all social problems and shape all aspects of society. This shift from a market economy to a market-driven society has been accompanied by a savage attack on equality, the social contract and social provisions as wages have been gutted, pensions destroyed, health care put out of reach for millions, job security undermined, and access to crucial public goods such as public and higher education considerably weakened for the lower and middle classes. What is particularly distinctive about the conjuncture of neoliberalism and fascism is how the full-fledged liberation of capital now merges with an out-and-out attack on the racially oppressed and vulnerable populations considered disposable. Not only do the oppressive political, economic and financial structures of casino capitalism bear down on people’s lives, but there is also a frontal attack on the shared understandings and beliefs that hold a people together. One crucial and distinctive place in which neoliberalism and fascism converge is in the undermining of social bonds and moral boundaries. Displacement, disintegration, atomization, social isolation and deracination have a long history in the United States, which has been aggressively exploited by Trump, taking on a distinctively right-wing, 21st-century register. There is more at work here than the heavy neoliberal toll of social abandonment. There is also, under the incessant pedagogical propaganda of right-wing and corporate controlled media, a culture that has become cruel and cultivates an appetite for maliciousness that undermines the capacity for empathy, making people indifferent to the suffering of others or, even worse, willing participants in their violent exclusion. What is often labeled as an economic crisis in American society is also a crisis of morality, sociality and community. Since the 1970s, increasing unregulated capitalism has hardened into a form of market fundamentalism that has accelerated the hollowing out of democracy through its capacity to reshape the commanding political, social and economic institutions of American society, making it vulnerable to the fascist solutions proposed by Trump. As an integrated system of structures, ideologies and values, neoliberalism economizes every aspect of life, separates economic activity from social costs, and depoliticizes the public through corporate-controlled disimagination machines that trade in post-truth narratives, enshrine the spectacle of violence, debase language and distort history. Neoliberalism now wages a battle against any viable notion of the social contract, solidarity, the collective imagination, the public good and the institutions that support them. As the realm of the political is defined in strictly economic terms, the institutions, public goods, formative cultures and modes of identity essential to a democracy disappear, along with the informed citizens necessary to sustain them. As more and more power is concentrated in the hands of a corporate and financial elite, freedom is defined exclusively in market terms, inequality is cast as a virtue, and the logic of privatization heaps contempt upon civic compassion and the welfare state. The fatal after-effect is that neoliberalism has emerged as the new face of fascism.13 With the 50-year advance of neoliberalism, freedom has become its opposite. And democracy, once the arc of civic freedom, now becomes its enemy, because democratic governance no longer takes priority over the unchecked workings of the market. Neoliberalism undermines both the social and the public and in doing so weakens the idea of shared responsibilities and moral obligations. As Zygmunt Bauman argues “ethical tranquillization” is now normalized under the assumption that freedom is limited to the right to only advance one’s own interests and the interests of the markets. Freedom in the neoliberal playbook disavows any notion of responsibility outside of the responsibility to oneself. As Wendy Brown argues, politics and democracy are now viewed as the enemy of markets and “politics is cast as the enemy to freedom, to order and to progress.”14 Politics now becomes a mix of regressive notions of freedom and authority whose purpose is to protect market-driven principles and practices. What disappears in this all-encompassing reach of capital is the notion of civic freedom, which is replaced by securitization organized to protect the lawless workings of the profit motive and the savagery of neoliberal austerity policies. Moreover, as freedom becomes privatized, it feeds a lack of interest in politics and breeds moral indifference. As a consequence, neoliberalism unleashes the passions of a fascist past in which the terrain of politics, agency and social relations begin to resemble a war zone, a blood sport and a form of cage fighting. Given the alarming signs that have come into play under the Trump administration, it is hard to look away and condone the suppression of the history and language of fascism and its relevance for understanding America’s flight from the promise and ideals of a substantive democracy. This is not to suggest the only template for addressing the legacy of fascism is to point to Nazi Germany, the most extreme of the fascist states, or, for that matter, to Mussolini’s brand of fascism. Not only does the comparison not work, but it tends to understand fascist ideals only against its most extreme expressions. While it is true the U.S. may not be putting millions in gas chambers or promoting genocide, there remain reworked elements of the past in the present. For instance, there are already echoes of the past in existing and expanding infrastructures of punishment—amounting to a carceral state—that have grown exponentially in the past four decades. In fact, the United States has the largest prison system in the world, with more than 2.5 million people incarcerated. Astonishingly, this figure does not include immigrant detention centers and other forms of encampment around the U.S. border with Mexico. The visibility of this state-sanctioned punishing apparatus and its similarity to a fascist history was on display recently with the caging of young immigrant children who were forcibly separated from their parents at the southern border for months at a time. Needless to say, such institutions and actions resonate with deeply disturbing events of a dark past for which the violent separation of families was a hallmark feature of fascist brutality. Reports of widespread abuse of imprisoned unaccompanied migrant children separated from their parents are increasingly being reported in the press. Detained under inhumane and cruel conditions, many of these children in government detention centers are allegedly being drugged, sexually abused, and subject to a range of inhumane actions. In Texas, a federal judge ordered a detention center to stop forcing children to take psychotropic drugs such as Clonazepam, Divalproex, Benztropine and Duloxetine in order to control their behavior. Needless to say, such actions, policies, and institutions resonate with deeply disturbing events of a dark past in which the violent separation of families was a hallmark feature of fascist cruelty, barbarism and brutality. It is against this background that I believe the current debates that dismiss whether the U.S. under Trump is a fascist society are unproductive. The argument against this recognition generally proceeds by claiming either fascism is a relic of the past, fixed in a certain historical period with no relevance to the present, or that the differences between Trump’s policies and those of Hitler and Mussolini are enough so as to make any comparison irrelevant. Many commentators denounce any references to Trump and Nazis in the past as exaggerated, extreme or inapplicable. In this view, fascism is always somewhere else, relegated to a time and a place that suggests an accommodating distance, one that runs the risk of disconnecting historical memory and the horrors of another age from the possibility of fascism resurrected in a different form, newly attuned to its moment. We live in an age in which there is a terror on the part of critics to imagine the plasticity of fascism. The ghost of fascism has to be retrieved from history and restored to a “proper place in the discussions of the moral and political limits of what is acceptable,”25 especially at a moment when the crisis of democracy cannot be separated from the crisis of neoliberalism. As a heuristic tool to compare forms of state power, the legacy of fascism offers an opportunity to recognize when authoritarian signposts are on the horizon. For example, under Trump, the spectacle reigns supreme, harking back to an earlier time in history when bravado, armed ignorance and theatrical performances provided a model of community that squelched memory, domesticated thought and opened the door for a strongman’s followers to disavow their role as critical agents in favor of becoming blind, if not willful, spectators. With regards to the present, it is crucial to recognize the ascendancy of Trump politically within rather than against the flow of history. Fascism in the United States has arrived slowly by subversion from within. Its roots have been on display for decades and emerged most visibly with President George W. Bush’s and then President Barack Obama’s war on terror. Bush, in particular, embraced unapologetically a raw display of power that sanctioned torture, domestic spying, secret prisons, kill lists, laws sanctioning indefinite detention, warrantless searches and war crimes. Obama did little to correct these legal illegalities and Trump has only breathed new life into them. Instead of the sudden appearance on American streets of thugs, brown shirts, purges and massive state violence—the state violence waged against African Americans notwithstanding—fascism has been resurrected through the enabling force of casino capitalism, which has unleashed and mobilized a range of economic, political, religious and educational fundamentalisms. The corporate state, fueled by a market fundamentalism and a long legacy of racial apartheid, has imposed almost incomprehensible cruelty on poor and vulnerable black populations. The merging of neoliberalism and fascist elements of white supremacy and systemic racism is particularly evident in the environmental racism, dilapidated schools and air pollution that have come to light recently.28 The short list includes going so far as to sacrifice poor black children in Flint, Mich., to the perils of lead poisoning to increase profits, subject the population of Puerto Rico to unnecessary despair by refusing to provide adequate government services after Hurricane Maria,29 and creating conditions in which “America’s youngest children, some 47 percent” under the age of 5, “live in low-income or poor households.”30 W.E.B. Du Bois’ notion of a “racial dictatorship” in his classic “Black Reconstruction in America” has been resurrected under Trump. As U.N. Special Rapporteur Philip Alston reported, amid a massive concentration of wealth among the upper 1 percent in the United States, 40 million people live in poverty and 18.5 million Americans live in extreme poverty. According to Alston, such neoliberal policies are “aggressively regressive” in their promoting of harsh work requirements for welfare recipients, cutting back programs to feed poor children, and the willingness to both incarcerate young children and separate them from their parents.31 All the while, the Trump administration has shifted massive resources to the wealthy as a result of a tax policy that shreds $1.5 trillion from the federal budget. Since the 1970s, wages have stagnated, banks have cheated millions out of their homes through rigged mortgage policies, and the political power brokers have imposed financial ruin on minorities of class and race.32 The war against poverty initiated by President Lyndon B. Johnson’s administration had been transformed into a war on poverty by President Ronald Reagan and has accelerated and achieved its apotheosis under the Trump regime. With a pathological enthusiasm, Trump’s morally bereft Republican Congress has cut crucial benefits for the poor, such as the food stamp program, while also imposing harsh work requirements on Medicare recipients. There is more at work here than the self-serving and vindictive neoliberal belief that government is bad when it gets in the way of markets and does not serve the interest of the rich. There is also willfully savage support for massive degrees of inequality, human wretchedness, the criminalization of social problems, and a burgeoning culture of punishment, misery and suffering. What is crucial to understand is that neoliberalism is not only a more extreme element of capitalism, it has also enabled the emergence of a radical restructuring of power, the state and politics, and in doing so converges with a style of fascism suited to the American context. Political theorist Sheldon Wolin, in his book “Democracy Incorporated,” was one of the first to analyze the transformation of a capitalist democracy into what he called an inverted form of totalitarianism. According to Wolin, the political state was replaced by a corporate state that exploits all but the ruling classes, empties politics of any substance through rigged elections, uses the power of capital to define citizens largely as consumers of products, and applies the power of the corporate state as a battering ram to push through policies that strengthen the power of capital. For Wolin, neoliberalism was the endpoint of a long process “to transform everything—every object, every living thing, every fact on the planet—in its image.”35 He believed that this new political formation and form of sovereignty in which economics dominated politics was hostile to both social spending and the welfare state. Wolin rightly argued that under neoliberalism, political sovereignty is largely replaced by economic sovereignty as corporate power takes over the reins of governance. Under neoliberalism, the welfare state has been largely dismantled, while the power of a punishing apparatus of an emerging police state has been expanded, buttressed by a pervasive culture of fear that exempts itself from the legalities and constitutional obligations of a democracy, however neutered. Wolin was keenly aware of the ruthlessness of corporate culture in its willingness to produce striking inequalities in an epical war on the promise and ideals of a substantive democracy. Trump also has used his power to pardon people such as right-wing pundit Dinesh D’Souza and former Arizona sheriff Joe Arpaio, who defied court orders to stop racially profiling Latinos. He has publicly accused Democrats in Congress for not standing following his State of the Union address and has conducted a foreign policy that trashes Western allies while celebrating authoritarian strongmen. Trump has elevated himself as the patron saint of a ruthless neoliberalism. This is evident in the various miracles he has performed for the rich and powerful. He has systemically deregulated regulations that extend from environmental protections to worker safety rules. He has enacted a $1.5-trillion tax policy that amounts to a huge gift to the financial elite and all the while maintaining his “man of the people” posture. He has appointed a range of neoliberal fundamentalists to head major government posts designed to serve the public. Most, like Scott Pruitt, the former head of the Environmental Protection Agency, and Betsy DeVos, the secretary of Education, have proved to be either corrupt, incompetent, or often both. Along with the Republican Congress, Trump has vastly increased the military budget to $717 billion, creating huge financial profits for the military-industrial-defense complex while instituting policies that eviscerate the welfare state and further expand a war machine that generates mass suffering and death. Trump has reduced food assistance for those who are forced to choose between eating and taking medicine, and his policies have prevented millions from getting adequate health care. 43 Last but not least, he has become a cheerleader for the gun and security industries going so far as to call for the arming of teachers as a way to redress mass shootings in the nation’s schools. All of these policies serve to unleash the anti-liberal and anti-democratic passions, fears, anxieties and anger necessary to mainstream fascism. Trump extends the logic of redundancy and disposability beyond economic categories to all those others who cannot fit into a white nationalist script. This is the language of the police state—one fashioned by the history of U.S. apartheid. The endpoint of the language of white supremacy via a regressive crime policy is a form of social death, or even worse. What is frightening about Trump’s racist vocabulary is that it registers a move from the coded language of benign neglect to policies marked by malignant cruelty that legitimates state violence. The United States is in a dangerous moment in its history, which makes it all the more crucial to understand how a distinctive form of neoliberal fascism now bears down on the present and threatens to usher in a period of unprecedented barbarism in the not too distant future. In an attempt to address this new political conjuncture, I want to suggest that rather than view fascism simply as a repetition of the past, it is crucial to forge a new vocabulary and politics to grasp how neoliberal fascism has become a uniquely American model for the present. One way to address this challenge is to rethink what lessons can be learned by interrogating how matters of language and memory can be used to illuminate the dark forces connecting the past and present as part of the new hybridized political nightmare. Fascism begins not with violence, police assaults or mass killings, but with language. Trump reminded us of this in 2015 while announcing his candidacy for president. He stated, without irony or shame, that “when Mexico sends its people, they’re not sending the best. They’re sending people that have lots of problems and they’re bringing those problems. They’re bringing drugs, they’re bringing crime. They’re rapists and some, I assume, are good people. …”48 This is more than the language of polarization or a strategic dog whistle, it is an overt discourse and theatrical performance in the service of white supremacy and racist violence, a logic largely missed by the mainstream press at the time. This initial blast of racist invective served to forecast how Trump’s campaign and presidency would appeal to white nationalists, the alt-right and other neo-Nazis groups. It is worth noting that words are not just about the production of meaning but also about how they generate consequences, especially in light of how such meanings—buttressed by state-sanctioned relations of power—function in a larger context. Some meanings have a force that others don’t, especially because power confers authority and can set in motion a range of effects. This is particularly clear in light of how Trump uses the power of the presidency at times when reacting to critics, especially those who garner some public attention through their criticism of him or his policies. His attempts to squelch dissent takes on a rather ruthless register as he often publicly humiliates those who criticize him, threatens their livelihood and uses language that functions to incite violence against his critics. We have seen too many instances in which Trump’s followers have beaten critics, attacked journalists and shouted down any form of critique aimed at Trump’s policies—to say nothing of the army of trolls unleashed on intellectuals and journalists critical of the administration. As a tool of state repression, language holds the potential to open the door to fascism. As Rose Sydney Parfitt observed, “The language, symbols and logic of fascism are being deployed today more overtly than at any time since the early 1940s.”52 Trump uses language that dehumanizes and makes it more acceptable for individuals to rationalize racist beliefs and practices. Under the Republicans’ “Southern strategy” and later in the Clinton, Bush and Obama administrations, racism was either coded in dog-whistle discourses or rendered unspeakable in the language of color blindness. Trump discarded such formalities by making racist language overt, shockingly deployed as a badge of honor, and pragmatically used as a nod to his base of support. Reminiscent of Nazi tactics to dehumanize enemies, he has called some undocumented immigrants “animals” and “criminals,” and has used the word “infest” in referring to immigrants on the southern border. Columnist and author Aviya Kushner asserted Trump’s tweet claiming that immigrants will “infest our country” bears an alarming resemblance to the Nazi claim that Jews were carriers of disease.53 In response to Trump’s use of the term “animal” to refer to some immigrants, Juan Cole argues the Nazis used the term as a “technical term, ‘Untermensch’ or underman, subhuman” in referring to “Jews, gypsies, gays, and other groups as well as the slaughter of Russian boys at the Eastern Front.”54 Making them appear as less than human paved the way “toward permitting their elimination.”55 A convergence between Trump’s language and the race-based ideology of Holocaust-era Nazis was clearly heard when Trump implied a moral equivalency between the violence perpetrated by white supremacists and neo-Nazis marching in Charlottesville and the presence of peaceful protesters demonstrating for the removal of a Confederate statue. Trump’s scapegoating rhetoric of demonization and bigotry not only dehumanizes racialized others, it also prepares the ground for encouraging hate groups and an intensification of hate crimes. Unsurprisingly, historical memory as a form of enlightenment and demystification is surely at odds with Trump’s abuse of history as a form of social amnesia and political camouflage. For instance, Trump’s use of the 1930s-era slogan “America First” marks a regressive return to a time when nativism, misogyny and xenophobia defined the American experience. This inchoate nostalgia rewrites history in the warm glow and “belief in an essential American innocence, in the utter exceptionality, the ethical singularity and manifest destiny of the United States.”59 Philip Roth aptly characterizes this gratuitous form of nostalgia in his “American Pastoral” as the “undetonated past.” Innocence in this script is the stuff of mythologies that distort history and erase the political significance of moral witnessing and historical memory as a way of reading, translating and interrogating the past as it impacts, and sometimes explodes, the present. Under Trump, language and memory are disabled as words are emptied of substantive content and the space of a shared reality crucial to any democracy is eviscerated. History and language in this contemporary fascist script are paralyzed in the immediacy of tweeted experience, the thrill of the moment and the comfort of a cathartic emotional discharge. The danger, as history has taught us, is when words are systemically used to cover up lies, falsehoods and the capacity to think critically. In such instances, the public spheres essential to a democracy wither and die, opening the door to fascist ideas, values and social relations: Trump has sanctioned torture, ripped babies from their parents’ arms, imprisoned thousands of young immigrant children, and declared the media along with entire races and religions to be the enemy of the American people. In doing so, he speaks to and legitimates a history in which state violence becomes an organizing principle of governance and perversely a potentially cathartic experience for his followers. At the same time, the corruption of language is often followed by the corruption of memory, morality and the eventual disappearance of books, ideas and human beings. Prominent German historians such as Richard J. Evans and Victor Klemperer have made clear that for fascist dictators, the dynamics of state censorship and repression had an endpoint in a politics of disappearance, extermination and the death camps. Trump’s language of disappearance, dehumanization and censorship is an echo and erasure of the horrors and barbarism of another time. His regressive use of language and denial of history must be challenged so the emancipatory energies and compelling narratives of resistance can be recalled to find new ways of challenging the ideologies and power relations that put them into play. Trump’s distortion of language and public memory are part of a larger authoritarian politics of ethnic and racial cleansing that eliminates the genocidal violence waged on Native Americans, black slaves and African-Americans. Indifferent to the historical footprints that mark expressions of state violence, the Trump administration uses historical amnesia as a weapon of (mis)education, power and politics, allowing public memory to wither and the architecture of fascism to go unchallenged. What is under siege in the present moment is the critical need to keep watch over the repressed narratives of memory work. The fight against a fascist erasure of history must begin with an acute understanding that memory always makes a demand upon the present, refusing to accept ignorance as innocence. As reality collapses into fake news, moral witnessing disappears into the hollow spectacles of right-wing media machine, which is state-sanctioned weaponry aimed to distort the truth, suppress dissent and attack the critical media. Trump uses Twitter as a public relations blitzkrieg to attack everyone from his political enemies to celebrities who have criticized him.60 The merging of journalism as entertainment with a culture addicted to speed, brevity and the pornographic exposure that digitization affords has emptied speech of any substance and further legitimates the unspeakable. Language no longer expands the reach of history, ethics and justice. On the contrary, it now operates in the service of slogans, bigotry and violence. Words are now turned into an undifferentiated mass of ashes, critical discourse reduced to rubble, and informed judgments a distant radioactive horizon. Under the Trump presidency, neoliberal fascism has restructured civic life that valorizes ignorance, avarice and willful forgetting. In the current Trumpian moment, shouting replaces the pedagogical imperative to listen and reinforces the stories neoliberal fascism tells us about ourselves, our relations to others and the larger world. Under such circumstances, monstrous deeds are committed under the increasing normalization of civic and historical modes of illiteracy. One consequence is that comparisons to the Nazi past can whither in the false belief that historical events are fixed in time and place and can only be repeated in history books. In an age marked by a war on terror, a culture of fear and the normalization of uncertainty, social amnesia has become a power tool for dismantling democracy. Indeed, in this age of forgetfulness, American society appears to revel in what it should be ashamed of and alarmed over. Even with the insight of history, comparisons between the older orders of fascism and Trump’s regime of brutality, aggression and cruelty are considered by commentators to be too extreme. There is a cost to such caution. 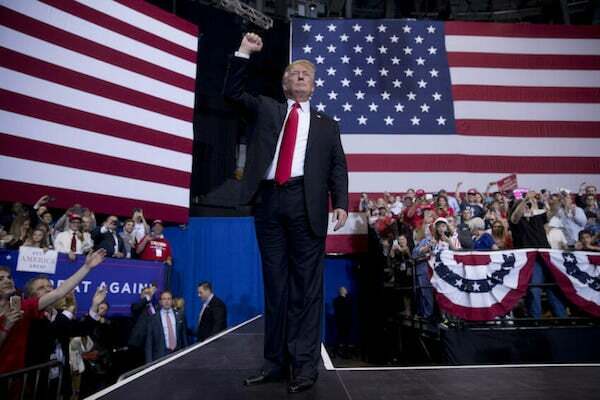 As writer Jonathan Freedland points out in The Guardian, “If the Nazi era is placed off limits, seen as so far outside the realm of regular human experience that it might as well have happened on a distant planet–Planet Auschwitz–then we risk failure to learn its lessons.”61 Knowing how others successfully fought against elected demagogues such as Trump is crucial to a political strategy that reverses impending global catastrophe. Trump’s selective appropriation of history wages war on the past, choosing to celebrate rather than question fascist horrors. The past in this case is a script that must be followed rather than interrogated. Trump’s view of history is at once “ugly and revealing.”64 Such narratives undermine moral witnessing, transform agency into a weapon of violence, and use history as a tool of propaganda. All the more reason why, with the rise of neoliberal fascism, there is a need for modes of historical inquiry and stories that challenge the distortions of the past, transcend private interests and enable the American public to connect private issues to broader historical and political contexts. The production of new narratives accompanied by critical inquiries into the past would help explain why people participated in the horrors of fascism and what it might take to prevent such complicity from unfolding again. Comparing Trump’s ideology, policies and language to a fascist past offers the possibility to learn what is old and new in the dark times that have descended upon the United States. The pressing relevance of the 1930s is crucial to address how fascist ideas and practices originate and adapt to new conditions, and how people capitulate and resist them as well. Since the 1970s, the social structure has been under relentless attack by an assemblage of political, economic and educational forces of organized neoliberal agendas. All the commanding institutions of corporate capitalism have enshrined a notion of citizenship that reduces individuals to consumers while promoting regressive notions of freedom and choice defined primarily through the practice of commercial exchange. Freedom, in the neoliberal edition, has been transformed into an obsession with self-interest, part of a war culture that ruthlessly pits individuals against each other while condoning a culture of indifference, violence and cruelty that rejects any sense of political and moral responsibility. This often takes the form of the freedom to be a racist, homophobe and sexist, to experience the liberty to hate and demonize others and to inflict violence and emotional harm under the guise of freedom of speech. Such values also mock any form of dependency, empathy and compassion for others. Atomization, fear and anxiety are the breeding ground of fascism. Not only do such forces undercut the radical imagination and collective resistance, they situate language and memory in the vise of a politics of depoliticization. Neoliberal fascism insists that everything, including human beings, are to be made over in the image of the market. Everyone is now subject to a paralyzing language of individual responsibility and a disciplinary apparatus that revises downward the American dream of social mobility. Time is now a burden for most people and the lesson to draw from this punishing neoliberal ideology is that everyone is alone in navigating their own fate. At work here is a neoliberal project to reduce people to human capital and redefine human agency beyond the bonds of sociality, equality, belonging and obligation. All problems and their solutions are now defined exclusively within the purview of the individual. This is a depoliticizing discourse that champions mythic notions of self-reliance and individual character to promote the tearing up of social solidarities and the public spheres that support them. At the core of neoliberal fascism is a view of subjectivity that celebrates a narcissistic hyper-individualism that radiates with a near sociopathic lack of interest in others with whom it shares a globe on the brink of catastrophe. This project is wedded to a politics that produces a high threshold of disappearance and serves to disconnect the material moorings and wreckage of neoliberal fascism from its underlying power relations. Neoliberal fascism thrives on producing subjects that internalize its values, corroding their ability to imagine an alternative world. Under such conditions, not only is agency depoliticized, but the political is emptied of any real substance and unable to challenge neoliberalism’s belief in extreme inequality and social abandonment. This fosters fascism’s deep-rooted investment ultra-nationalism, racial purity and the politics of terminal exclusion. One step toward fighting and overcoming the criminogenic machinery of terminal exclusion and social death endemic to neoliberal fascism is to make education central to a politics that changes the way people think, desire, hope and act. How might language and history adopt modes of persuasion that anchor democratic life in a commitment to economic equality, social justice and a broad shared vision? The challenge we face under a fascism buoyed by a savage neoliberalism is to ask and act on what language, memory and education as the practice of freedom might mean in a democracy. What work can they perform, how can hope be nourished by collective action and the ongoing struggle to create a broad-based democratic socialist movement? What work has to be done to “imagine a politics in which empowerment can grow and public freedom thrive without violence?”68 What institutions have to be defended and fought for if the spirit of a radical democracy is to return to view and survive? Federico Finchelstein, From Fascism to Populism in History (Oakland: University of California Press, 2017), p. xi. Two excellent examples can be found in Lawrence Grossberg’s Under the Cover of Chaos: Trump and the Battle for the American Right (London: Pluto Press, 2018) and Carl Boggs’ Fascism Old and New: American Politics at the Crossroads (New York: Routledge, 2018). For an analysis of the complex legacy of right-wing and fascist forces that have contributed to Trump’s election and his popularity among fringe groups, see Shane Burley, Fascism Today: What It Is and How to End It ( Chicago: AK Press, 2017). Neoliberalism has a long and complex history and takes a variety of forms. I am using the more generic elements of neoliberalism as I use the term in this essay. See Kean Birch, “What Exactly is Neoliberalism?” The Conversation [Nov. 2, 2017] Online: https://theconversation.com/what-exactly-is-neoliberalism-84755. For an extensive analysis of neoliberalism in terms of its history and variations, see Pierre Dardot and Christian Laval, Never Ending Nightmare: How Neoliberalism Dismantles Democracy (New York: Verso, 2019); Richard D. Wolff, Capitalism’s Crisis Deepens: Essays on the Global Economic Meltdown (Chicago: Haymarket, 2016); Wendy Brown, Undoing the Demos: Neoliberalism’s Stealth Revolution (New York: Zone Books, 2015), Henry A. Giroux, Against the Terror of Neoliberalism (New York: Routledge, 2008), and David Harvey, A Brief History of Neoliberalism(Oxford University Press, 2005). Wendy Brown, Undoing the Demos: Neoliberalism’s Stealth Revolution(New York: Zone Books, 2015), p. 9. One brilliant source here is Henrich Geiselberger, The Great Regression(Cambridge: Polity Press, 2017). See, especially, Michael D. Yates, The Great Inequality (New York: Routledge, 2016) and Joseph E. Stiglitz, The Price of Inequality (New York: Norton, 2012). Timothy Snyder, On Tyranny: Twenty Lessons From the Twentieth Century (London: Polity Press, 2017: New York, NY), p. 65. Paul Gilroy, Against Race (Cambridge: Harvard University Press, 2000), p. 141. Theodor W. Adorno, “The Meaning of Working Through the Past,” Guild and Defense, trans. Henry W. Pickford (Cambridge: Harvard University Press, 2010), pp. 214. Cited in Marie Luise Knott, Unlearning With Hannah Arendt, trans. by David Dollenmayer (Other Press: New York, 2011, 2013), p. 17. Robert O. Paxton, The Anatomy of Fascism (New York: Alfred A. Knopf, 2004), p. 202. Paul Gilroy, Against Race (Cambridge: Harvard University Press, 2000), p. 144. Naomi Klein, The Battle for Paradise: Puerto Rico Takes on the Disaster Capitalists (Chicago: Haymarket, 2018). See, for instance, Gordon Lafer, The One Percent Solution: How Corporations Are Remaking America One State at a Time (Ithaca: Cornell University Press, 2017). Elizabeth Hinton, From the War on Poverty to the War on Crime: The Making of Mass Incarceration in America (Cambridge: Harvard University Press, 2017). I take up these issues at length in Henry A. Giroux, American Nightmare: Facing the Challenge of Fascism (San Francisco: City Lights Books, 2018). Kean Birch and Vlad Mykhnenko, “Introduction: A World Turned Right Way Up,” The Rise and The Fall of Neoliberalism: The Collapse of an Economic Order (New York: Zed Books, 2010), pp. 7-8. See David Neiwert, Alt-America: The Rise of the Radical Right in The Age of Trump (New York: Verso, 2017). See, for instance, Paul Street, “Capitalism: The Nightmare,” Truthdig[Sept. 20, 2017]. Online: https://www.truthdig.com/articles/capitalism-the-nightmare/ Also, Paul Buchheit, Disposable Americans: Extreme Capitalism and the Case for a Guaranteed Income (New York: Routledge, 2017). Byung-Chul Han, In the Swarm: Digital Prospects, tr. Erik Butler (Cambridge, Mass. : MIT Press, 2017), p. 13. Herbert Marcuse, An Essay on Liberation (Boston: Beacon Press, 1969), p. 14. Sanctions, sanctions, sanctions–the final demise of the dollar hegemony?